I know what you are thinking - "Hello, lovely.....nom nom nom" Yes, that is a portobello mushroom burger that you will be making this summer. Everybody loves to talk about eating less meat, but few will admit to liking a mushroom more than 8 ounces of beef. But, I gotta tell you that this rocks! I am not a fan of veggie, tofu, or Boca burgers - but portobello mushroom caps are different. First, they cost a lot. I have had sticker shock at the price of a portobello cap which was $2 at my local Stop and Shop. Ouch. I have a new saying that I am poaching from a yoga class, "Get comfortable with the uncomfortable." I am uncomfortable paying $2 for a mushroom. Why? Well, its a mushroom! On the other hand, this mushroom is delicious grilled and saves me 400 calories when compared to an eight ounce burger. Now, I am starting to feel comfortable - especially around the waist band of my pants. Ahhhhhhh. The calorie reduction is actually not the best reason to make these healthy portobello burgers. With the spinach added you get 266% of your daily value of vitamin A, 31% of DV of iron, and 18% of your DV of calcium. This is a delicious low cal burger with a multi-vitamin stuck inside. The recipe below includes some olive oil that I have added to make the mushrooms tastier. Mushrooms do not have any fat, so it is a good thing to add some to help them be more flavorful. These burgers are surprisingly MEATY. I don't know why but the consistency gives a feeling of heft when you eat them. Don't compare these to real burgers if you can help it. Just give this a try on "Meatless Monday". Heat 1 tablespoon oil in large saucepan. Add spinach and saute until completely wilted. Put in bowl and reserve. Preheat grill or broiler to medium high heat. Lightly rinse the mushroom caps under running water and ensure that stems are removed or very short. Do not immerse because mushrooms soak up water like a sponge. Brush each cap with 1/2 tablespoon olive oil and place mushrooms on the grill cap side down (or the flat side). Grill for 5 to 8 minutes on each side until tender. 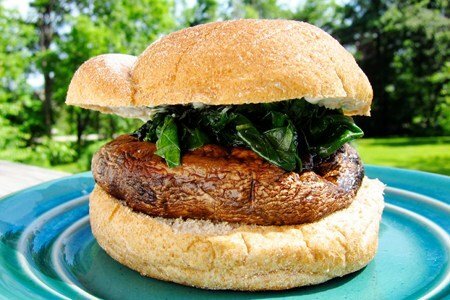 Put mushroom, spinach, and mayonnaise (optional) on each bun and enjoy! Besides using fat free cheese, how can you add protein to this meal without adding more fat? I make sure I have a great deal of protein with each meal. I LOVE mushroom burgers!! Spread laughing cow cheese on a toasted sandwich flat, add mushroom and roasted red pepper - YUM! I don't care for mushrooms and I don't eat beef. I prefer a salmon or turkey burger. I will try with spinach though never thought to put spinach on a burger. I love mushrooms. I use portobellos all the time, as burgers, stuffing them. I love putting avocado on it. Gives some great flavor and healthy fat. Helene: I sometimes stuff my mushrooms with refried beans. Flavor it with some taco seasoning and you got a Mexican twist on a burger. Or if I need to add protein to a meal and don't want to use cheese, I'll drink milk or have yogurt for a snack. Summer = a good burger!! And I love mushrooms and portabellas. I was actually excited to lately learn that mushrooms are one of the few foods to have Vitamin D. SG, would you happen to know how much? I love portobello burgers. At costco they sell a 5 pack for $5 so i eat them pretty often. To up the flavor i do like to add balsamic vinegar and worcestershire sauce while it cooks. Next time i will definitly try wilting the spinach first. Tried this burger-loved it. Made the second time around with the laughing cow-FANTASTIC!! It's funny how we think about $2.00 for something good for us (mushroom), but we don't question the price tag on junky food we like. We need to turn our thinking around!! Ooh these are so yummy! We have them all the time and they really are surprisingly meaty. They are really good with fire roasted red peppers too! For the poster that asked about how to add more protein, I make these and top them with a bean spread. Just purée cannelinni or another white bean in a food processor with a little olive oil, water, garlic and thyme. Tastes great spread on a bun with a mushroom marinated in balsamic vinegar and a little oil. Mmmm. Thanks Snack-Girl. I've four of these in my fridge - from my local co-op for less than a dollar each - and am just not feeling like doing my usual with them. I've been wondering about grilling and now, thanks to you, I know how! Grass-fed hamburgers are healthy too - and depending on where you live, are around the same price. Grass-fed meat is full of healthy fats. "Ooooh" is what I said when I opened my email. I LOVE bellas as 'burgers'! Add a scrambled egg and some bacon crumbles and you get a really filling breakfast sandwich that feels decadent. Now I will be craving mushrooms all day! Guess I have to stop at the store on my way home! Just added these to menu for the weekend too! Having just happily paid $7/lb for grass-fed beef burgers which I eat sparingly due to drastic reduction in meat consumption, portobellos are great alternatives. I like 'em with tom, onion and sweet pickle slices, cheddar, smidge of mustard, etc. Oh, they are better than beef. To up protein, a side of broccoli or a very big salad with lots of variety. I'm sure this is wrong (:), but I always rip off the stems at the store when I buy portabellas. It cuts the price, and everyone knows you aren't going to use the stem, so why pay for it? Mary, I take mushroom stems, chop up with onion, saute in evoo/butter, splash in some balsamic or wine then freeze in sm. containers to adorn future burgers, steaks, omelets, etc.! The simplicity of this ready-made topping turns a simple meal into a bistroesque special! Another tip I use for all things burger: my fav is to use a hard roll, but I slice in 3rds and use a thinner top and bottom for my ''burger'' thus cutting calories, then the center 3rd is either saved for making bread crumbs or birdfood! Now I know what I well have for an option with the hamburgers and hotdogs. I really don't feel like making my own veg. burgers this weekend. Thanks for the idea. Just started liking these a couple of years ago. Great with balsamic vinegar. That's how I started liking them. i just got your email this morning. made the portobello with spinach. it was our first time with mushroom,it was great. i didn't want to fire up the hibachi for only two mushrooms. made it in a toaster oven. the recipe was great. but it was wet. did i do something wrong? I had portobello burgers for myself at our Memorial Day cookout. A number of people asked to try it. Most preferred it to the fatty burgers they were eating. Good thing I made more than one. I prepped it with balsamic glaze instead of olive oil. Delicious! I have been thinking about these burgers, if you haven't tried these mushrooms grilled you are missing out. All of my kids love these. You are so right about the price, if they were cheaper we could easily eat this every week. We have bought them at Sams Club but haven't priced them recently. When my family makes burgers, to make it healthier we put in carrots which makes it healthier. It also tastes like a normal Burger and if you don't like carrots you can't taste the carrots. Plus it makes it a bit colorful!